Will 2014 be the end of the Castro dictatorship? 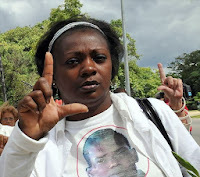 A while back the brutal and racist Castro Brothers' regime released an unbelievable (for people who live in free societies that is) video, where it depicts the leader of The Ladies in White, Berta Soler, who is Afro-Cuban, as some sort of "ignorant gorilla" character. The Ladies in White are a peaceful democracy movement composed of the wives, daughters, mothers and relatives of Cuban political prisoners. Many of the members of this valiant group are Afro-Cuban women. Why is a dictatorship so afraid of a group of mostly elderly women? Because these courageous Cuban mothers and grandmothers refuse to back down in spite of being beaten, jailed and smeared. They know that they are perhaps the seed to the end of the world's longest existing dictatorship. This video (below) is part of the Castro regime's heavy-handed efforts to smear and destroy courageous pro-democracy women leaders such as Berta Soler and Cuban blogger Yoani Sanchez. This racist video should be not only condemned internationally, but also adds more evidence to the disturbing racist heavy boot of the Cuban dictatorship. I call for President Obama and the Congressional Black Caucus to make the treatment of Afro-Cubans and all Cubans one of their top International Human Rights policy priorities for 2014!